From the Department of Neurology (Z.D., X.L., X. Cao, J.W., B.L. ), Chinese PLA General Hospital; Department of Neurology (X. Chen), Beijing Haidian Hospital, Beijing Shi; and Department of Neurology (J.M. ), China-Japan Union Hospital of Jilin University, Jilin Sheng, China. Intracranial venous sinus malformation is a rare but treatable condition among patients with idiopathic pulsatile tinnitus. Retrievable devices under local anesthesia may promote a simultaneous diagnosis for patients with suspected venous pulsatile tinnitus, thus avoiding futile implantation. The underlying etiology of the intracranial venous system was not fully investigated in tinnitus workups. Interventional therapy for suspected venous pulsatile tinnitus harbored the risk of futile implantation. A 50-year-old woman presented with a 2-year history of right-sided pulsatile tinnitus. Her medical history was unremarkable. Over the preceding 2 years, with the diagnosis of idiopathic pulsatile tinnitus, a bruit gradually developed and severely disturbed her sleep (Tinnitus Handicap Inventory score of 58). Upon physical examination, the tinnitus did not disappear by compression of the right internal jugular vein or internal carotid artery. Auscultation also evidenced no murmur in either retroauricular region. Otoscopy, Doppler ultrasound, and MRI were all normal. A thin bony layer of the anterior fossa in temporal bone CT suggested a high jugular bulb (figure 1A). Cerebral angiogram suggested a high-riding jugular bulb and a relative stenosis of the right transverse sinus (figure 1B). (A) Temporal bone CT shows a thin bony layer of the anterior jugular fossa. (B) The venous phase of diagnostic cerebral angiography shows a high-riding jugular bulb and a relative stenosis of the right transverse sinus. (C) The venous phase of postoperative cerebral angiography shows a mild improvement of the stenosis in the transverse sinus. (D) Operative cerebral venography shows a mild stenosis of the right transverse sinus. (E.a) Schematic diagram of the T-S-J system. (E.b–E.d) Schematic diagram of the pulsatile tinnitus–related lesions in the T-S-J system. Owing to significant decrease in quality of life, the patient consented to take the endovascular treatment with retrievable Solitaire stent under local anesthesia. Seven days before the procedure, aspirin (100 mg daily) and warfarin (3 mg daily) therapy were initiated. Under local anesthesia, an 8F guiding catheter was placed at the level of the jugular foramen. Following a PT floppy guide wire (0.014 inches, Boston Scientific, Marlborough, MA), a Rebar 27 microcatheter (2.4F, ev3 Neurovascular, Minneapolis, MN) was navigated into the posterior part of the superior sagittal sinus. Simultaneously, the patient reported that her tinnitus remarkably ceased. Further, guided by the response of the patient, the PT guide wire was then retrieved from the catheter for intrasinus angiography to confirm the location and length of stenosis (figure 1D). After carefully placing the catheter into the proper position through the stenosis, a retrievable Solitaire AB stent (6/30 mm, ev3 Neurovascular) was then advanced to the distal tip of the microcatheter. Then, the stent was released and detached, and a persistent improvement of symptoms was reported (figure 1C). After the procedure, IV heparin was maintained for the first 24 hours, followed by 1 year of aspirin (100 mg daily) and 15 months of warfarin (3 mg daily). No recurrence of tinnitus was observed at a 16-month follow-up. From 2009 to 2015, 53 patients with ascertained venous PT underwent endovascular surgery in our center. As previously reported, our procedures were initially conducted using Precise self-expanding stents (Cordis, Hialeah, FL) under general anesthesia.7,8 However, even with a high ratio of efficiency (50/53), a certain number of patients with suspected PT remained untreated. A subset of these patients, who exhibited mild lesions of the venous sinuses, may decline the interventional therapy due to fear of futile implantation and complications. Nevertheless, a tortuous venous system that is difficult to navigate with Precise self-expanding stents typically causes the physician to abandon further procedures after a preoperative assessment. In our earlier attempt, we tried to use new devices to resolve these problems. The original idea of employing Solitaire stent in venous PT was generated from the 2 patients who had intracranial hypertension caused by cerebral venous sinus thrombosis or stenosis. During the procedure, the Solitaire stent was successfully navigated through the tortuous vessels. After the operation, even with less radical force than Precise self-expanding stent, the intracranial hypertension and related symptoms were found to be markedly relieved. We further applied the Solitaire stent under general anesthesia to another patient with a most likely diagnosis of venous PT. We found that the tinnitus ceased when the patient awoke after the operation (figures e-1, e-2, and e-3 at Neurology.org). Nevertheless, based on the experiences of the previous cases, we developed the retrievable and awake procedure with less risk of futile implantation for the patient in this report. In particular, diagnostic angiography of our patient revealed only a relative stenosis and a high jugular bulb. However, without accurate data regarding its prevalence in the general population, it is considered a relatively common finding, especially in patients without idiopathic intracranial hypertension (IIH).9 Thus, whether this mild change was directly responsible for the symptoms remained controversial before the operation. Consequently, our team would face a dilemma if no improvement was achieved with a permanent stent or coil implantation after the patient awoke from general anesthesia. Therefore, based on the experiences of our previous interventional regimen, a retrievable stent and local anesthesia were considered. However, even with this successful case, the risks of venous sinus stenting may be life-threatening as other intracranial interventional therapies. We note the strengths and limitations for future applications of this procedure as follows. Strengths: (1) Longitudinal flexibility of the Solitaire stent is compatible for patients with tortuous lesions. (2) The patients experience only mild pain, and therefore, local anesthesia is possible for the operation. (3) Keeping the patient awake under local anesthesia can ascertain the preoperation diagnosis and avoid ineffective implantation during the procedure. Limitations: (1) Considering the risks of intracranial interventional therapy, the benefits and potential risks to the patient and the experience of the neurointerventionists should be carefully assessed before the operation. (2) To exclude IIH, measurement of the intracranial pressure through lumber puncture and measurement of the pressure gradient across the stenosis are recommended prior to surgery. (3) This procedure must be proven effective in additional patients with PT and with longer follow-up periods. Compared with previously reported regimens of Precise self-expanding stent implantation, the use of retrievable stents for venous PT is rare. However, as we expected, there was no recurrence of PT in the 16 months of follow-up. This result may provide new insight into the mechanism of venous PT. The accepted mechanism of venous PT is that the anatomic variation of the intracranial venous system causes turbulent blood flow. Separately, the predilection sites were the transverse sinus, sigmoid sinus, and jugular bulb.3,–,7 Considering the anatomical relationships, these 3 venous structures formed a consecutive canal, which we termed the T-S-J system (figure e-1). Based on a literature review of the previously reported venous PT cases (table e-1), we summarized the malformations of the T-S-J system into 3 categories (figures e-2 and e-3): type I, stenosis; type II, dilation (diverticulum/aneurysm or high-riding jugular bulb); and type III, mixed stenosis and dilation. The traditional target of surgical or interventional procedures seeks the anatomic restoration of the T-S-J system. Alternatively, as an explanation for the response of our patient during the operation, the redirection of the turbulent blood flow within the T-S-J lumen may be more meaningful. In the 3 types of malformations, turbulent flow may be due to changes in the diameter along the vessel. In our case, the angiographic studies showed a relative stenosis of the transverse sinus and high-riding jugular bulb. According to the traditional route, both deficits should be fixed. However, in our endovascular procedure, Solitaire stent placement also produced a good outcome but without a perfect anatomic restoration, even for the stenosis. Therefore, we hypothesized that the Solitaire stent may play a key role in redirecting the nonlaminar blood flow in the T-S-J system. This hypothesis matches the booming procedure described in arterial circulation.10 The experience gained from this case indicates that the laminar state of the blood flow may be more important than the drainage within the T-S-J system as a venous origin of PT. However, the blood redirection effect of Solitaire stents must be evidenced with a more accurate detection of blood flow within the intracranial venous sinuses. Zhihua Du: study concept and design. Xinfeng Liu: acquisition of data. Xiangyu Cao: acquisition of data. Xinping Chen: acquisition of data. Jing Mang: acquisition of data and critical revision of the manuscript. Jun Wang: critical revision of the manuscript for important intellectual content. Baomin Li: study concept and acquisition of data.
. Prevalence, severity, exposures, and treatment patterns of tinnitus in the United States. JAMA Otolaryngol Head Neck Surg 2016;142:959–965.
. Inner ear conductive hearing loss and unilateral pulsatile tinnitus associated with a dural arteriovenous fistula: case based review and analysis of relationship between intracranial vascular abnormalities and inner ear fluids. Case Rep Otolaryngol 2015;2015:817313.
. Endovascular treatment of pulsatile tinnitus caused by dural sinus stenosis. Skull Base Surg 1997;7:145–150.
. Aneurysm of a dural sigmoid sinus: a novel vascular cause of pulsatile tinnitus. Ann Neurol 2000;48:669–671.
. Endovascular treatment of two concomitant causes of pulsatile tinnitus: sigmoid sinus stenosis and ipsilateral jugular bulb diverticulum. Case report and literature review. Acta Neurochir 2012;154:89–92.
. Hybrid carotid stent for the management of a venous aneurysm of the sigmoid sinus treated by sole stenting. 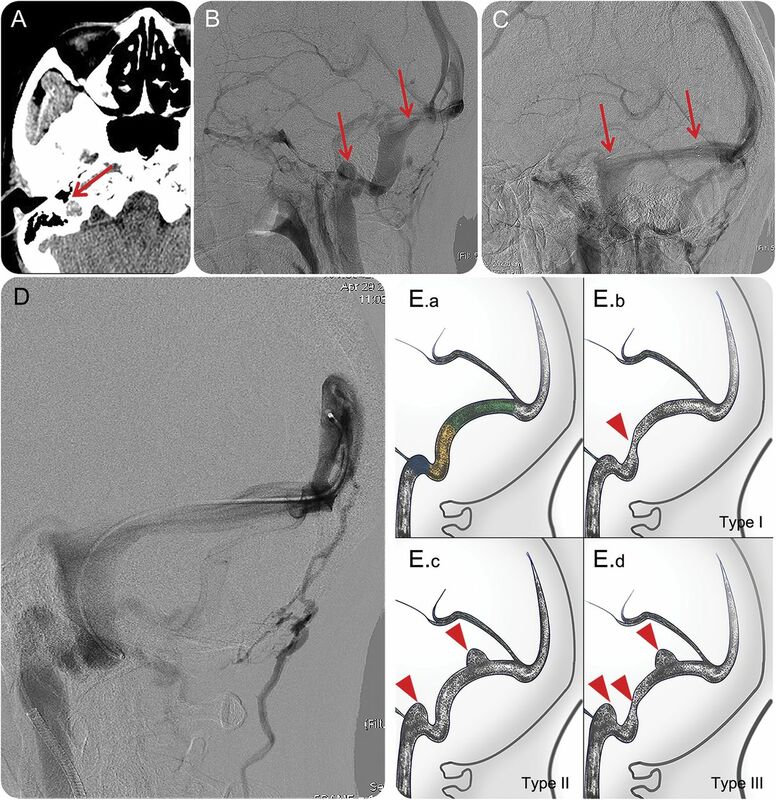 Vasc Endovascular Surg 2012;46:342.
. Stent-assisted coil embolization of a transverse-sigmoid sinus diverticulum presenting as pulsatile tinnitus. Turk Neurosurg 2013;26:632–634.
. Angioplasty and stenting for intractable pulsatile tinnitus caused by dural venous sinus stenosis: a case series report. Otol Neurotol 2014;35:366–370.
. Prevalence of dural venous sinus stenosis and hypoplasia in a generalized population. J Neurointerv Surg 2016;8:1173–1177.
. Treatment of unruptured intracranial aneurysms with the pipeline embolization device. J Clin Neurosci 2014;21:6–11.